There are new techniques and metrics just introduced by McKinsey and CFO Magazine, and an industry-generated metric from Broadcom entitled “R&D Efficiency,” during the spring of 2015. They all focus on measuring overall R&D productivity, output over input. One of them has a good chance of becoming mainstream in the next five years, just as Return On Innovation (early 2000s) and the Vitality Index (1988) did. As well, there has been the equivalent of a sea change in the metrics companies use since the market crashed in 2008. It became evident in 2013 and is ongoing. Did you reorient your metrics, by about 25%, towards business and financial output in the past five years? 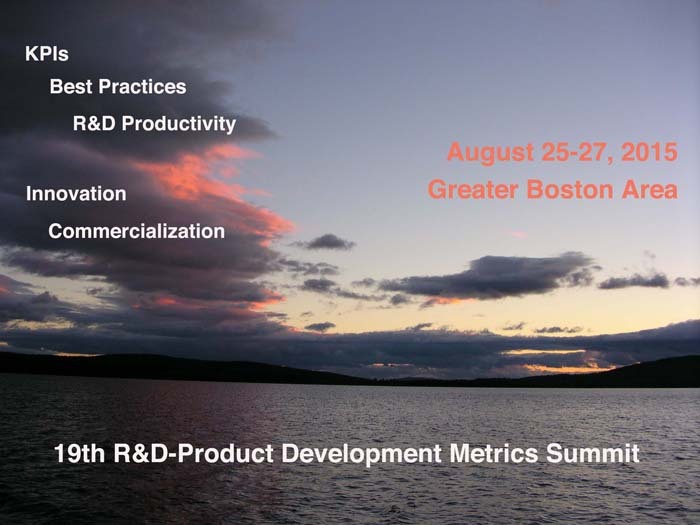 This Summit covers everything an executive needs to know relating to measuring R&D, Advanced Development, Product Development, Innovation, Technical and Functional Competencies, R&D Productivity, and R&D-related Intellectual Property. We will connect the numerous metrics going three levels deep into the R&D-Product Development organizations to the handful of KPIs needed by the CEO for financial reporting and investors in a single one-page portfolio. The selections of metrics are different for every company, and highly strategy dependent. You get what you measure. Don’t worry, you’ll get to include any of the metrics you measure today in your final workshop solution. GGI is consistently told by leaders, who enter believing that they have strong metrics, that they have a great many things they are going to discuss doing and undoing when they get back to their office. GGI has been a recognized thought leader in measurement since the early 1990s. We have introduced more than a handful of metrics that companies use today. We have played a role in making a number of great metrics, created by others, become mainstream across industries. For eighteen years we have done primary research on corporate, project, technical, functional, innovation, productivity, and IP metrics being adopted by corporations. For twenty-five years we have kept our finger on the pulse of what is being done by others, and on emergent metrics that haven’t significantly penetrated industry (yet). This enables participants to determine a competitive advantage set of KPIs and their necessary supporting measures. Our Summit is as close as you will get to internalize the metrics body of knowledge in a single event. Every Summit is current. This entry was posted on Wednesday, June 10th, 2015 at 11:00 pm	and is filed under Blogroll, Finance, Metrics, Process, Strategy. You can follow any responses to this entry through the RSS 2.0 feed. You can leave a response, or trackback from your own site.